The New York Times #1 Bestseller from the author of The Nightingale "An unforgettable portrait of love and war" People Alaska, 1974. Untamed. Unpredictable. A story of a family in crisis struggling to survive at the edge of the world, it is also a story of young and enduring love... read full description below. The New York Times #1 Bestseller from the author of The Nightingale "An unforgettable portrait of love and war" People Alaska, 1974. Untamed. Unpredictable. A story of a family in crisis struggling to survive at the edge of the world, it is also a story of young and enduring love.Cora Allbright and her husband Ernt, a recently-returned Vietnam veteran scarred by the war, uproot their thirteen year old daughter Leni to start a new life in Alaska. Utterly unprepared for the weather and the isolation, but welcomed by the close-knit community, they fight to build a home in this harsh, beautiful wilderness.At once an epic story of human survival and love, and an intimate portrait of a family tested beyond endurance, The Great Alone offers a glimpse into a vanishing way of life in America. 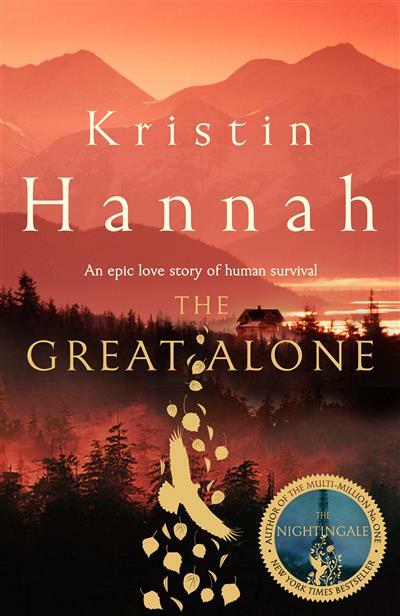 With her trademark combination of elegant prose and deeply drawn characters, Kristin Hannah has delivered an enormously powerful story that celebrates the resilience of the human spirit and the remarkable and enduring strength of women.About the highest stakes a family can face and the bonds that can tear a community apart, this is a novel as spectacular and powerful as Alaska itself. It is the finest example of Kristin Hannah's ability to weave together the deeply personal with the universal. Kristin Hannah is a New York Times bestselling author. She is a former lawyer turned writer and is the mother of one son. She and her husband live in the Pacific Northwest near Seattle, and Hawaii. Her first novel published in the UK, Night Road, was one of eight books selected for the UK's 2011 TV Book Club Summer Read, and her recent novel The Nightingale was a New York Times number one bestseller, selling almost three million copies worldwide.